It’s December, and winter is already here. But if you prefer spending your time snuggled inside your cosy blanket, it is a criminal waste of great weather. Here’s a brilliant way to make the most of these months: Plan an extraordinary journey to witness the finest culture of the country. Goomo, India’s travel tech platform has curated a special list of these lovely mainstream festivals that you must put in your itinerary this holiday season. Camel Fair: Winter brings out the best in some places, and, Rajasthan is one such royal destination that gets prettier with the onset of winter. Apart from visiting the majestic havelis and breathtaking forts of the state, visit the desert land to revel in art, culture and festivals. Catch a glimpse of the spectacular camel performances, intriguing local folklores, extravagant firework display and more at the Camel Fair in Bikaner. The two-day affair scheduled from January 13-14, 2018 will mesmerise you with its splendour and make for a perfect getaway during the winter. Jaipur Literature Festival: Several literary fests take place in and around India. However, the Jaipur Literary Festival scheduled from January 24-29, 2018 at the Pink City of India is the world’s largest free event of its kind that will see renowned personalities including historians, politicians, humanitarians and business leaders grace attendees with their presence. The literary fest, with its stimulating conversations held in the backdrop of the famous Diggi Palace will offer a unique cultural and intellectual experience. Desert Festival: Witness the Thar Desert comes to life at the three-day extravaganza of Jaisalmer Desert festival. Scheduled from January 29-31, 2018, this is the time when the celebrations of the festival lighten up the desert with colour, enthusiasm, and happiness. The traditional and bright costumes, the folk music recitals, competitions like camel races, tug-of-war, moustache competition, gymnastic stunts along with mouth-watering food and artifacts make it an absolute must-visit destination during the winter. Theyyam: While Kerala is an epitome of tranquility and oozes picturesque beauty, its festivals, too, stand out for their grandeur and uniqueness. One offbeat festival of Kerala is Theyyam that originated in North Kerala. Scheduled to take place from February 23-26, 2018 in the Kasargod district of Kerala, the popular ritual dance, Theyyam represents a host of Gods and Goddesses dancing to the sounds of musical instruments like chenda, elathalam, kurumkuzal and veekkuchenda. The big and bright red headgear, heavy make-up, huge masks and flamboyant costumes make it one of the best visual art forms to be discovered in God’s Own Country. Rann Utsav: With its ancient temples and wildlife sanctuaries, Gujarat definitely is a treasure trove of architecture and history. Well, give them a miss and head to the desert of Kutch to experience a grand cultural fiesta. The ongoing India Rann Utsav is a melange of music, dance and craft. The white sands and full bloom moon make for picture-perfect scenery, especially in the winter months. Therefore, treat yourself to the cultural performances of traditional dancers, Kutch food, camel-back safari and more at the Gujarat’s Rann Utsav that ends on February 20, 2018. Kite festival: From stunt kites, rokkakus, deltas, miniature kites and inflatables, scan the skies during the renowned Ahmedabad International Kite Festival scheduled from January 7-15, 2018. Every nook and cranny of Ahmedabad’s streets and lanes will be full of makeshift shops selling kites of different colours and hues, sizes, and shapes. Come, witness the marvellous kite flying skills and incredibly artistic kites take to the skies during the festival. Do not forget to shop for beautiful handicrafts, knick-knacks, clothes, and spices sold at the time of the festival. Also, enjoy the local delicacies on offer for visitors, tourists, and locals alike. 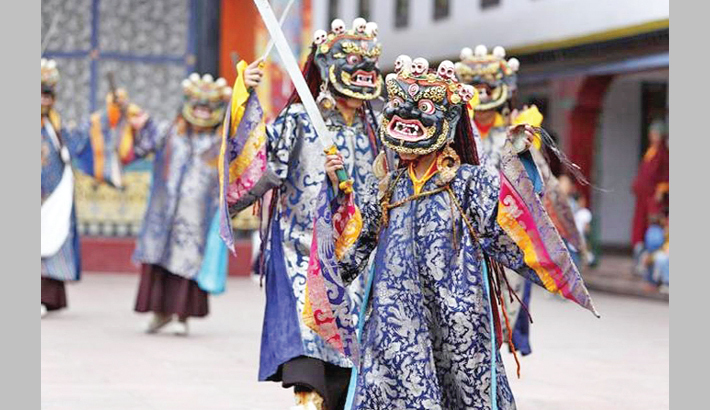 Losar: The Northeast states have a medley of fascinating festivals full of colours and that are rich in cultural history. When it comes to Sikkim, a visit to the Tibetan areas in the tiny Indian hill state is a must. In February, the Tibetans celebrate the Tibetan New Year, also known as Losar, with much gaiety and fervour. At the Pemayangste Monastery, tourists can witness the New Year celebrations, where certain special rituals are performed along with traditional dance forms. Catch all the action live at Gangtok for two days, from February 16-18, 2018.